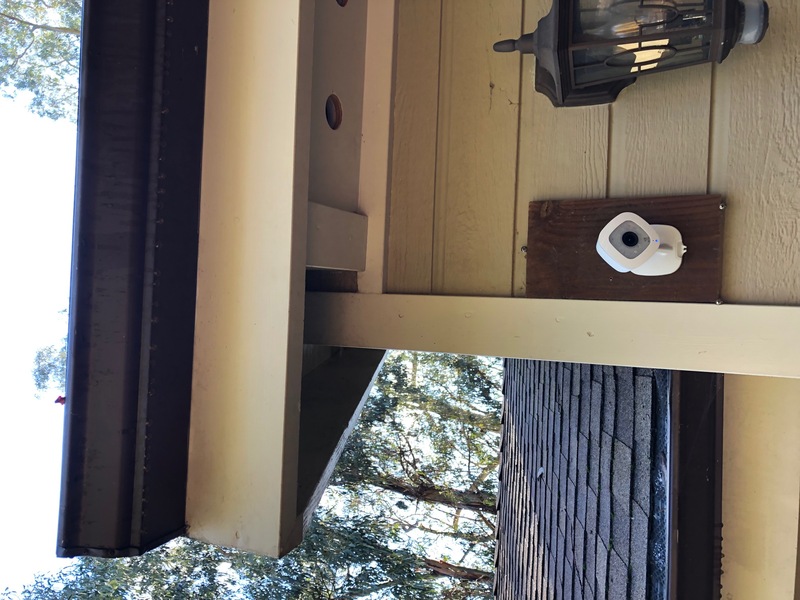 I have a camera mounted on a wood plank which in turn is mounted on the siding of the garage. Fortunately, it's under the eaves and I didn't see any water getting to this area in the rain. 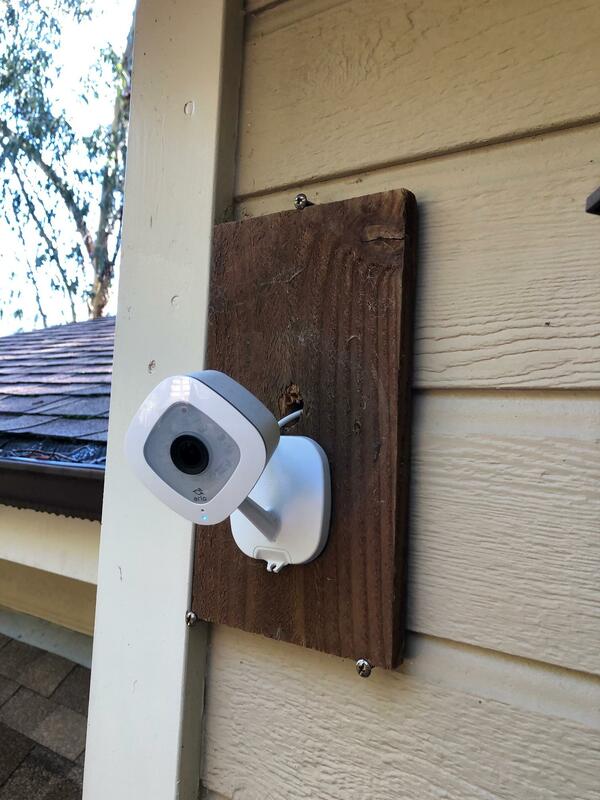 The dark wood plank looks ugly to me, so I want to get rid of it and either (1) mount the camera directly to the siding or (2) use some kind of a siding mounting block that is small and paintable. 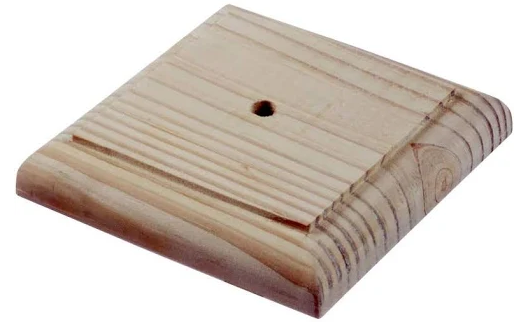 Unfortunately, behind the wood plank, there are 3 holes, each about 1-inch in diameter. 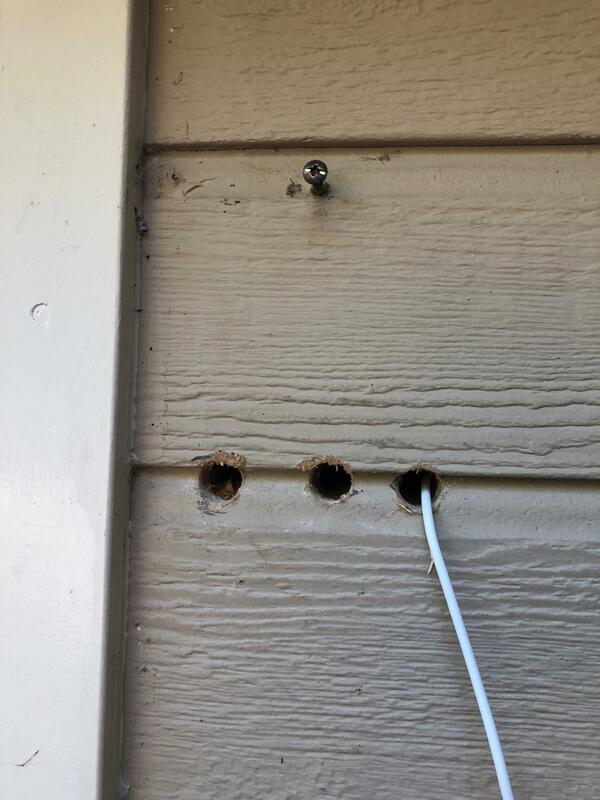 Looks like the installer drilled a hole and hit the stud, so drilled another hole, which also hit the stud, and finally on 3rd try, it went through all the way inside. Should I mount the camera directly to the siding, or use some kind of a siding mounting block? If I want to upgrade the camera at some point, would it be better to use a mounting block? What do I do with the 3rd hole (where the wire currently goes through) to make it smaller, less visible, and water proof? How do I patch the 1st and 2nd holes (which serve no purpose)? Three screws are currently holding the wood plank. How do I patch 3 screw holes once I get rid of the plank? I'm very new at this, so I'd appreciate any insight you could provide. Thank you so much! You could use this Exterior Post Top and either paint or stain it before installation. It already has a hole drilled in the center where you can run the wire through. You can also use the siding groove (where the holes are drilled) as a raceway for the wiring. This will prevent you from pinching the wire when you affix it to the wall. You can fasten this plate with two or three screws in such a way that your camera would cover them. All that would be left is that tiny hole at the top where the screw is. Just caulk that and touch it up with some paint. Not the answer you're looking for? Browse other questions tagged siding or ask your own question. How can can I get replacement wood siding to match the existing siding?